It's been a fun weekend in Phuket, with the Phuket Bike Week taking place from 10th - 12th April (see more here: Phuket Bike Week) and of course it's Songkran - the traditional Thai New Year. The official holiday dates are 12th - 15th April. The 13th (Monday) is the big day in Phuket, the day for fun and water throwing, a party on every street. The weather has almost behaved. Rain in the night on the 10th.. I reckon more than a few people got very wet at the free Carabao concert in Patong beach that night. 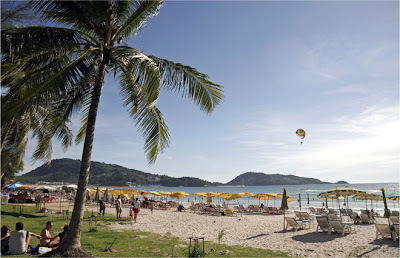 On Saturday I went down to Patong beach with my daughter to see what was going on for Bike Week. It was a hot sunny afternoon, very hot toasty weather. The last couple of days have also been hot. 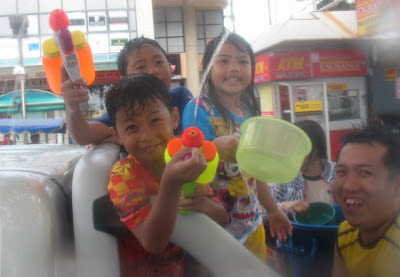 For a while it looked to me like Songkran on 13th April might be a wash out - heavy rain for about 20 minutes in the morning.. but the sun broke through, the rain went away and we drove over to Patong beach in our pick up truck for a couple of fun hours throwing water - lots of photos on Jamie's Phuket - Songkran 2009 - Patong Beach Phuket. You'll notice no mention of what has been going on in Bangkok - if you want to know a LOT more about it - click on Bangkok Pundit - anyway, seems to be all over now. My view in a few words - give Abhisit a chance. There will be an election soon enough. But this time, everyone has to accept the result.